This is more of a basic question, and Greg Stone answered this quite well in a recent webinar. So I have taken a few excerpts from his presentation to illustrate the points here. In separation science a sample consisting of a solvent with dissolved molecules is “fractionated” into its components via column chromatography. So how exactly does this process work? The column in this process is comprised of gel particles which have voids (=holes) in them. If a mixture of different molecules flow through a column, there is a difference between how large molecules and small molecules pass through this obstacle. 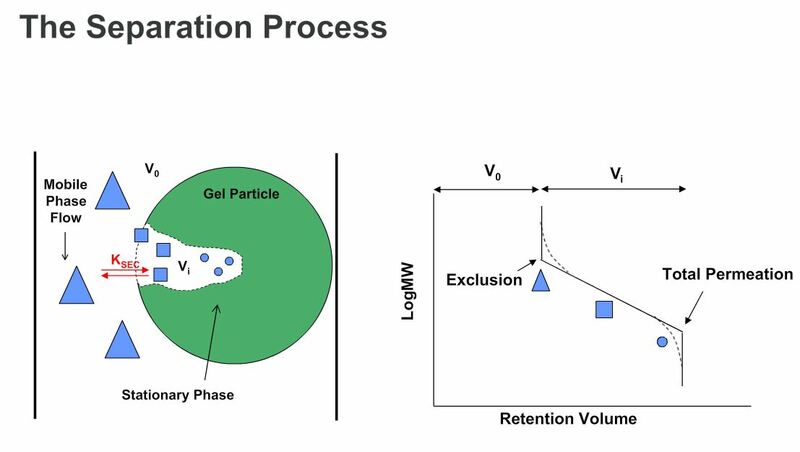 The mobile phase carries along the bigger particles, while the smaller molecules diffuse into the pores of the gel particles. The smallest molecules diffuse into all pores and have some residence time, the medium ones access some of them, and the largest molecules may be excluded from all pores, and thus elute first. In the picture above, the largest molecules (triangles in the graph) will come out first, and the smallest (in the graph as circles) will come out last. The exclusion point indicates that anything larger than this size, will all come out at the same time. The total permeation on the other hand represents that point, where all small molecules (or additives, monomer) will diffuse into all available pores, and nothing beyond this point (except the mobile phase itself) will leave the column. So what’s the difference between FIPA and GPC? 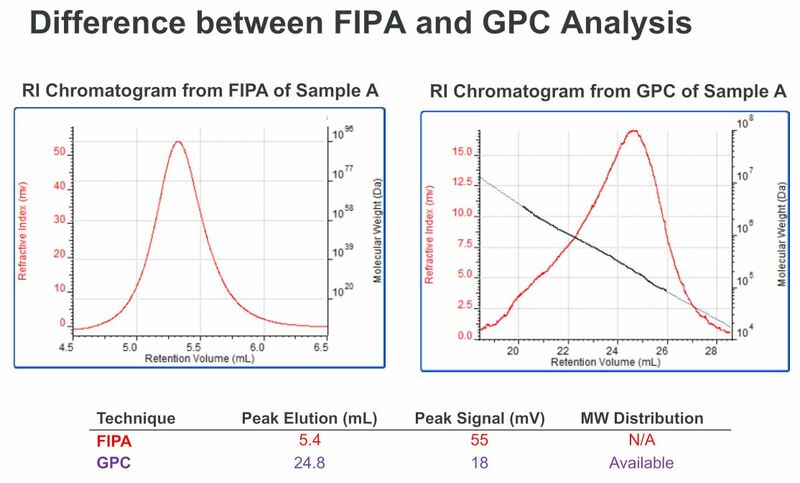 In this real example shown below, the peak in FIPA comes out much faster, since the total elution in GPC is larger. At the same time, in GPC the signal is spread out and the absolute signal height can get reduced. It is worth mentioning that the peak area of the same sample analyzed by GPC and FIPA is about the same, but with GPC/SEC it’s more spread out so the amplitude at any given point will be less. With FIPA we obtain somewhat better signal to noise, however the higher speed and stronger signal come at the cost of the molecular weight distribution. Because the sample is not really separated into the different molecular weight slices, we can’t get distribution information. Clicking on any of the images should take you directly to the relevant slide in Greg’s talk.